With thanks to BBC WORLDWIDE. 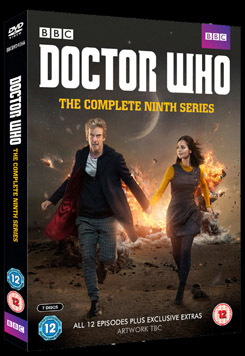 The critically acclaimed DOCTOR WHO Complete Ninth Series will be available on March 7th at £51.05 for DVD and £56.16 for Blu-ray. Peter Capaldi returns as the Doctor alongside Jenna Coleman with guests including Game of Thrones' Maisie Williams. Now that the Doctor and Clara have established a dynamic as a partnership of equals, they're relishing the fun and thrills that all of space and time has to offer. Tangling with ghosts, Vikings and the ultimate evil of the Daleks, they embark on their biggest adventures yet. Missy is back to plague the Doctor once more, the Zygons inspire fear as they shape-shift into human clones, and a new arrival moves in cosmic way. Maisie Williams talks about crossing fandoms, celebrates her birthday with an impromptu quiz, and generally everyone has a lot of fun, as Rufus Hound gives us a unique view of what it's like to make Doctor Who. Featuring interviews with Peter Capaldi and Maisie Williams. The Zygons are back! We discover how a Zygon keeps fit, and Ingrid Oliver tells of her delight at once more playing the Doctor's biggest fan, Osgood! Featuring interviews with Peter Capaldi, Jenna Coleman and Ingrid Oliver. Joivan Wade (Rigsy) is shocked to be back, but he's not the only character to return for this unforgettable adventure, as we discover the perils of thinking you are invincible. Featuring interviews with Peter Capaldi, Jenna Coleman and Steven Moffat. Steven Moffat and director Rachel Talalay reveal the challenges of creating the puzzle-box that is Heaven Sent, we get wind-blown in Fuerteventura, and we witness the departure of a companion as we go on set for Jenna Coleman's last day of filming. Featuring interviews with Peter Capaldi, Jenna Coleman, Steven Moffat and Rachel Talalay. Matt Lucas is our guide as we join River Song, the Doctor and a star-liner full of supervillains for this festive Christmas special. We get the heads-up on the Hydroflax from Greg Davies, reveal Alex Kingston's favourite Sonic, and we find out what Peter Capaldi is getting for Christmas. Featuring interviews with Peter Capaldi, Alex Kingston, and Steven Moffat. Join Alex Kingston and Steven Moffat as we look forward to River's return in The Husbands of River Song. Find out how River's character came to be created, why Alex just had to play the role, what happened when the cast discovered who River really is. Narrated by Nina Toussaint-White. In 2012, Jenna Coleman joined Doctor Who and took her place in television history as the Doctor's newest companion, Clara Oswald. Having become the longest serving companion since the revival of the show, Clara's time on the TARDIS has now come to an end, so we can now look back at just what made the Impossible Girl, well, possible. Featuring interviews with Peter Capaldi, Matt Smith and Jenna Coleman. Narrated by Colin McFarlane. Christel Dee gives a whistle-stop guide to Doctor Who: The Fan Show the online series that celebrates Doctor Who and the amazing creativity of the show's fans. We get a peek inside Steven Moffat's writing lair, take a look into the Old Monster's Retirement Home and step into the amazing world of Minecraft to find out how fans are celebrating their love for the show online. We even get face to face with the Doctor and Missy to ask them all the questions the fans want to know. Other VAM includes: the Series 9 US prequel – The Doctor's Meditation, deleted Scenes, Series 8 recap and all Series 9 trailers and prologue, the 2015 San Diego Comic Con Panel and an interview with Peter Capaldi and Jenna Coleman hosted by Wil Wheaton. Thanks for sticking with us whilst we've been (very) busy professionally (non-DOCTOR WHO) but, yes, we're still online. Apologies for the lack of updates but being online since April 2003 it is inevitable to go through peaks-and-troughs of reporting on all things DOCTOR WHO. A New Year's promise to get back-up-to-speed and up-to-date is now offered to visitors to the site. In the meantime, Happy Christmas and a prosperous New Year to you all.